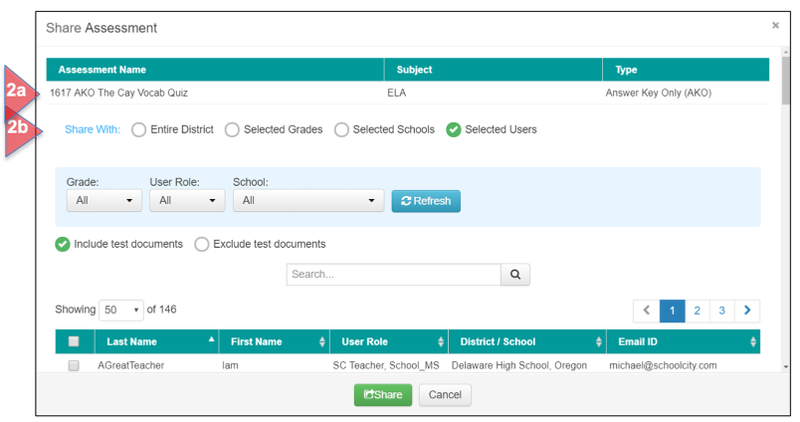 Once an assessment has been published, users at the Teacher and School level may share an assessment they have created with other users, depending on permissions granted by the district. 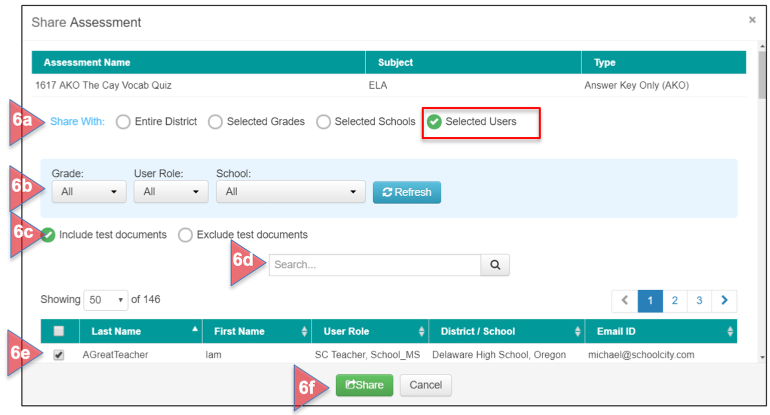 District level assessments are already available to all users within the district, so the sharing feature is not an option. From the Top Menu Bar, select Assessments (1a). Find the desired published assessment from the list in the Assessment Manager. Check the box next to the assessment name (1b), and then select the sharing icon located above the Functions column (1c). Assessment Name, Subject, and Assessment Type. Share With: Choose one of three ways to share: Entire District (See Step 3), Selected Grades (See Step 4), Selected Schools (See Step 5), or Selected Users (default setting) (See Step 6). Click on the circle next to Entire District. Select to Include or Exclude test documents (if any). Click on the circle next to Selected Grades. Check the box(es) of the grade level(s) with which you want to share your assessment. This shares the assessment with all teachers in the selected grade level(s). Click on the circle next to Selected Schools. Use the drop down menu to select the school(s) with which you want to share. This shares the assessment with all users in the selected school(s). Click on the circle next to Selected Users. Use the drop down menu to search for users by grade level, user role, and/or school, then click on Refresh. Or use the search bar to enter all or part of the name you wish to find, then click on the magnifying glass icon. Check the box next to each user’s name with whom you are sharing. The recipient(s) of the shared assessment will be able to access the shared assessment by selecting the Notifications (bell icon) in the Top Menu Bar. In the Notification Center, click on the green circle with a white plus sign to open the shared assessment. Click on View Test Document, Add to My Assessment, or Decline. Please refer to the Help document, Manage Assessments: Accessing a Shared Assessment, for more information.